In November 2017, I wanted to boost downloads of the Pro version of My Day To-Do, so I did (conducted) a little experiment. It was at this time that I thought of giving Facebook marketing another go for My Day To-Do. This time I thought of running an ad targeting app installs on Facebook. In this post, I will talk a bit about my background to Facebook marketing, some of my expectations behind this, the eventual outcome of this, my analysis of the results and what to watch out for the next time we run an ad campaign. All in all, I aim to share the lessons I learned from this and what can anyone else learn from my experience. 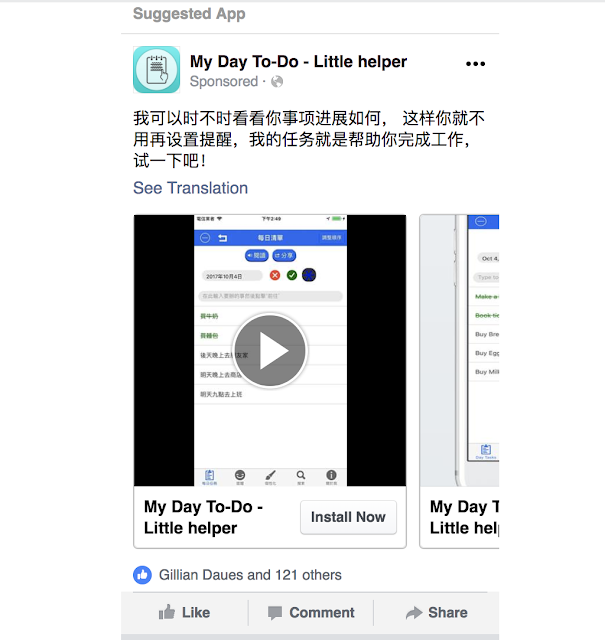 Therefore when I was running this experiment in November to promote the Pro version of My Day To-Do I thought it’s a good time to have another go at marketing via Facebook. My long term goal is to have just one app for My Day To-Do instead of having two versions in the form of Paid and Lite. In order to achieve that, I thought that for the Pro version it’s not just competitors apps but also it’s very own, younger ‘limited features’ sibling i.e. My Day To-Do Lite. Hence for a period of two weeks I removed the Lite version from sale on the App Store and tried to promote the Pro version. At this point I thought, perhaps doing some Facebook marketing around this time can only help the downloads. This lead to the creation of an app installs ad campaign. How did I find out about App Installs? Well I logged onto Facebook Ads Manager and clicked ‘create ad’ after which I got a few options regarding the type of ad I wanted to create. I choose app installs and then like every ad campaign you can select the daily budget, location, demographic etc etc. Having learned my lessons from my previous Facebook advertising experience (here and here), I wanted to target a very specific demographic. The reason for the region selection is owing to the fact that Facebook is not banned in these regions and they use Traditional Chinese for their written text there. I would love to target China only but alas, Facebook is inaccessible there (at least directly). What’s traditional Chinese? hmmm simply put, there are two ways to write Chinese, Simplified and Traditional. While Simplified Chinese is used in Mainland China, the regions listed above use traditional. Writing anything more on this is beyond the scope of this post. Why Malaysia? hmm Malay and Indians aside Malaysia also has Chinese population and I assumed that they would write using Traditional instead of Simplified Chinese. This one is interesting and not sure if I should label this yet another failed marketing attempt? Now as you can see the ad had over a 121 likes so it was good in that sense, however the likes don’t necessarily equal to app purchases. I mean I am not sure if we had any app installs because of this? I mean we didn’t get half as many downloads as likes during that time. Any graphs or numbers for the Ad performance? I would love to share whatever graphs I can from Facebook Ad Manager, however I can’t seem to find the performance numbers for this ad in Ad Manager. I could see the number of people reached and I can share that. In the interest of transparency I can also share are the download numbers from iTunesConnect, here’s a screenshot of my iTunesConnect console at the time the ad was running. So 18 downloads as reported by iTunesConnect is a much smaller number than than the 121 likes that the Facebook ad got. Now, what’s more interesting is the fact that I am not completely sure if the ad only reached the audience that I had targeted i.e. HongKong, Malaysia, Mccau and Taiwan? 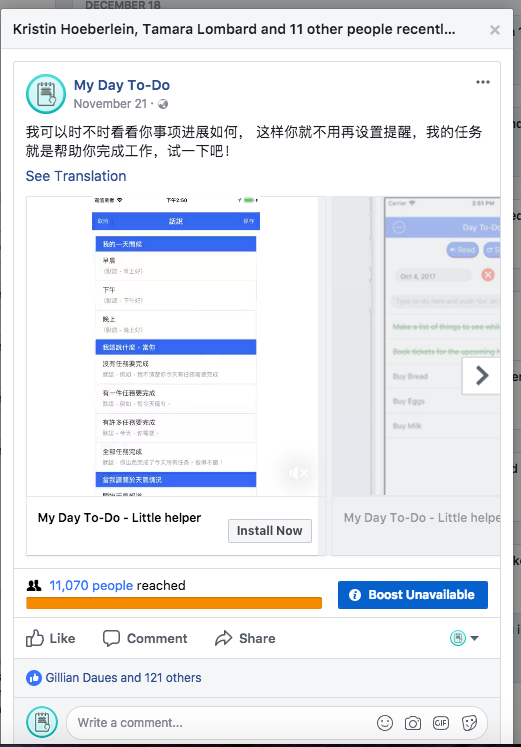 The reason I suspect this is because I clicked on the Facebook profile of some of the people liking this ad and not all of them were Chinese, I seriously doubt if some of them could even read Traditional Chinese or are in any of those targeted regions? Now this is a problem because the ad text is almost useless to anyone who cannot read the contents of it. I know going through people’s profiles sounds like stalking but please try to see where I am coming from, I am running a limited resources startup and I am allocating advertising funds to someone who’s clearly not a marketing expert i.e. ME. Hence it’s really important for me to see whether or not the ad is reaching the right target audience. Regarding the ad not reaching the right audience? Well, I cannot rule out the possibility that it’s probably my fault that I did not read something properly enough or I simply lacked the necessary knowledge of how these ad campaigns work. Based on the Facebook Ad Manager interface I assumed that it would only reach the people in my targeted regions, however bear in mind I am no marketing expert and I have to allocate my time between marketing, coding, future updates or IAPs, assigning work to interns, think about a potential workspace once my current lease expires etc etc the list goes on an on. This was my fourth attempt at marketing with Facebook and once again I would say the results were not positive or at least not what I was expecting. I think Facebook could potentially be an effective marketing tool and I am probably just not using it the right way. Hopefully the next time I engage in any Facebook marketing it’s through an expert at this i.e. it’s at a point when I have dedicated marketing staff at My Day To-Do. If you remember earlier in this post I mentioned that I was running this ad while I was conducting an experiment to boost sales of My Day To-Do. It may seem that the experiment was a failure and in terms of raw sales numbers, perhaps yes but it was not a complete failure as I did learn something very important about my users during this time. That’s a topic for another post and I will write about it soon. I have joined your rss feed and look forward to in search of more of your great post.